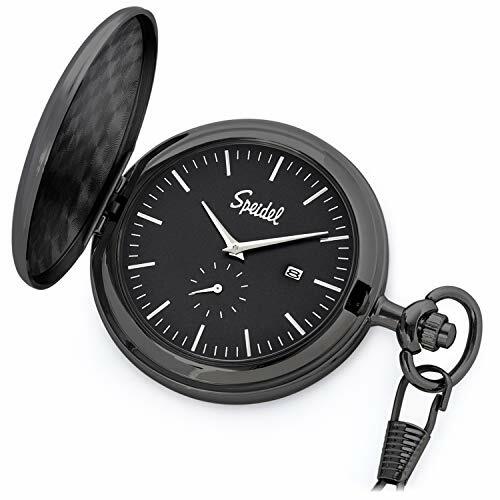 Speidel Classic Brushed Satin Black Engravable Pocket Watch with 14" Chain, Black Dial, Date Window, and Seconds Sub-Dial | What Should I Say? Classic brushed satin black pocket watch with an elegant minimalist dial design. Featuring a black dial, analog quartz movement, date window located at 3 o'clock, seconds sub-dial, highly polished hands and indexes, 14" diamond cut curb chain with easy to clasp spring ring and engravable front and back outer case. A Speidel pocket watch is a great holiday, birthday or any other special occasion gift idea packaged in a beautiful box that would make a great addition to anyone's timepiece collection.